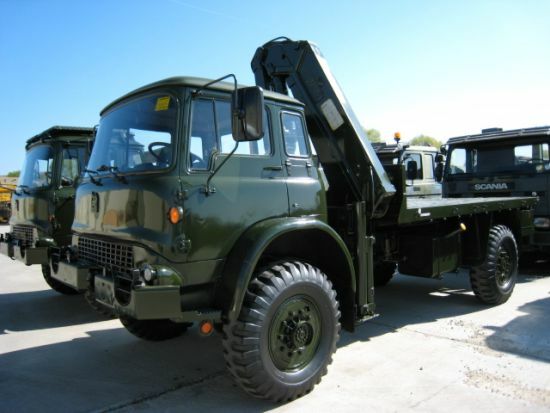 Bedford MJ cargo platforms trucks with Atlas Crane have proved to be immensely poular with the British Army for many years and are currently in service. They are simple, low maintanence go anywhere trucks. The vehicles have 2 speed transfer box and front axle disconnect. We can offer many different options for this EX.MOD cargo truck, from a simple chassis cab or a full service unit, fitted with compressors, welders, etc. Atlas AK3000 crane with hydraulic outriggers. The crane is situated behicnd the cab . The crane can lift 3,000kg @ 1m and can reach the full length of the body. The Bedford M-series general utility truck was a further development of the previous RL-series, dated back to the early 1950s. The M-series was developed in the early 1960s to meet the British Army requirement. It is a militarized version of commercial truck. Some 50 000 Bedfords have been manufactured for military service. The M-series trucks proved to be robust and reliable vehicles. In the British Army, who was the larger customer, it was known simply as 4-tonner. Many of these military trucks have been exported to Bangladesh, Belgium, Brunei, Denmark, Indonesia, Ireland, Kenya, Netherlands, Turkey United Arab Emirates and other countries. Production of this military truck continued until the 1989. Later Bedford was taken over by Marshalls. In 1989 the Leyland DAF T224 was selected by the British Army as the M-series replacement. The Bedford M series has a payload capacity of 4 000 kg, even though maximum load possible is over 6 000 kg. It is a true multi-purpose truck, used for all manner of military duties. The cargo area has drop-sides and tailgate. These can be removed for stowage of containers. For passenger transportation detachable seats are fitted in the center of the cargo area. Vehicle can carry 20 fully equipped troops. The canvas cover and bows were often removed. A hydraulic crane was fitted to some models in the cargo area for loading and unloading operations. This military truck can also tow trailers or artillery pieces. A forward control cab is of all-steel construction. There is a hatch in the roof, used to mount machine gun or for observation. Late production trucks can be recognized by the platform over the cab. The cab can be made mineproof, though this requires detailed work, carried out by a specialist firm. The initial production models were known as the MK, powered by a Bedford 5.4-liter multi-fuel engine, developing 98 hp. In 1981 a more powerful diesel engine, developing 103 hp, was introduced, which resulted in the MJ series. This military truck has selectable all wheel drive. Some vehicles were fitted with a 5 000 kg capacity winch. The Bedford M series comes in a number of variants, including dump truck, refueller, roadway laying vehicle, recovery vehicle, light reconnaissance drone carrier, signals vehicle, artillery control center, bridging truck and so on. Many automotive components of the Bedford M series truck were used on the Saxon armored personnel carrier, which is basically an armored truck, capable of operating in forward areas. Production of the Bedford MJ series trucks ceased in favor to the Bedford MT series.